UTC and the CETIM joined forces in 2008 to create a joint institute specialized in mechatronics grouping a training scheme, R&D and technology transfer facilities. The objective of the Institute is to encourage and facilitate training of engineers and collaborative research and, importantly also, to provide a joint offer with high added value services for both national and international enterprises. Mechatronics is a valuable vector for product design innovation, combining, as it does, mechanical engineering sciences and applications, electro-mechanical devices, data processing and communication systems. Mechatronics is a specialty found in space activities (satellites, ...), in aeronautics (stable flight control management), in road vehicles (ESP, ABS) and likewise in consumer goods such as washing machines or printer devices), in machines generally (aids to machine operations, adaptability of production means, on-line quality assessment ...); the specialty lies at the core of innovative processes and protocols. The Institute is in line with the evolution of mechanical engineering products in terms of controlled functionalities and efficiency criteria (performance, output, safety, cleanliness ...). 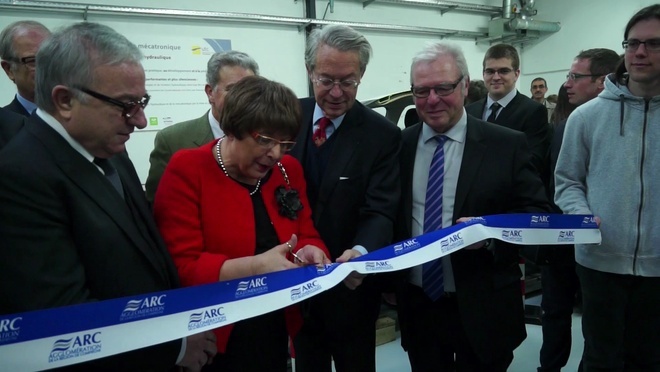 Within the mechatronics institute, UTC and the CETIM also agreed to create a Hydraulics-Mechatronics Chair initiated by the industrialists of these specialties and their professional trade union, ARTEMA, with financial support from the Picardie Region and the FEDER (EU) fund. The objective assigned here is to build up a network of technological resources specific to these specialties, using and relying on UTC's special know-how and skills in the area, combined with the CETIM capacities for technology transfer and also using their increasing closer proximity factor with industrialists. The creation of this Chair also strengthens the degree of interactivity in the Picardie Region among technology transfer and the market place in terms of outlets for hydraulic equipment. The key area for applications is still mechanical engineering, with a systemic approach in which the control-operation of actuators is an integrated feature. The associate research programme is definitively oriented to innovative applications and technologies for the purpose of improving performance levels, to contribute to future designs and widen the scope of applications for hydraulic transmission systems. improvements for systems and components in strategic area of energy efficiency objectives, noise abatement and reduced pollutants, and equipment operational safety. The Chair uses a specialized technical platform, grouping together design and modelling tools and various experimental rigs at the joint teaching and R&D premises. The chair and courses have enabled 80 engineers to be qualified in the dual specialties of hydraulics and mechatronics. Indeed, the products created developed in mechatronics - to the extent that they are fully equipped with sensors - can feel, touch, measure their environment. The question therefore is - what is the use of the sensors if we cannot analyse the data properly. This Chair has the objective to satisfy this requirement.